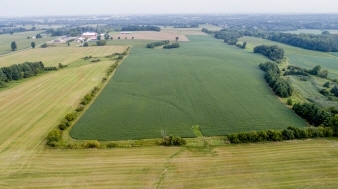 This 125 acre farm is ideally located just off the 401 corridor at interchange exit 199, just 10 minutes east of London and midway between Toronto and Windsor. London International airport is 15 minutes northwest. Dorchester is a small community with a rural feel experiencing growth and expansion. A major expansion to the Wastewater Treatment Plant is underway and several projects are being developed; Szucs Development is moving forward on a subdivision of 368 lots, Sifton Properties has recently completed construction of a 4-storey Retirement Residence in close proximity and Barry Wade Design Build is completing his project of 55 homes geared to downsizers nearby.